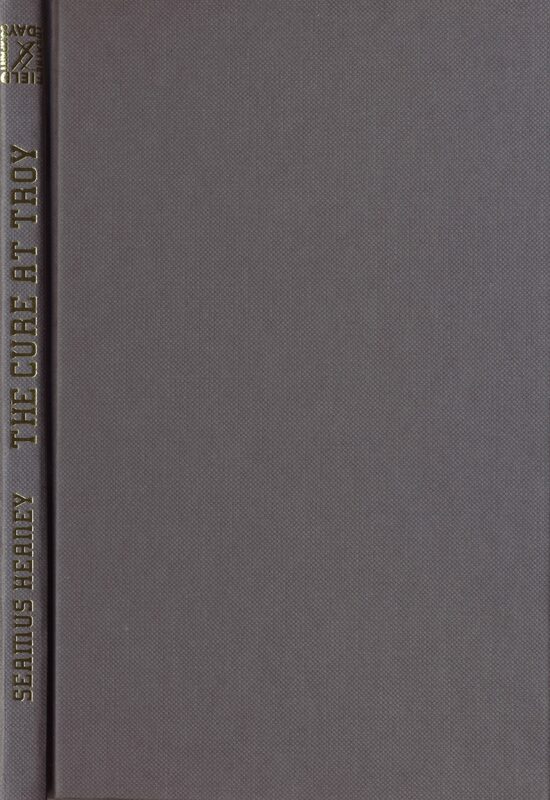 The Cure at Troy, by Seamus Heaney, after Sophocles’s Philoctetes. Play script. Original publication, Derry 1990. Limited Edition of 500. Excellent condition. Dust jacket missing. Heaney’s famous Field Day play and the source of many speeches since, memorably quoted by President Bill Clinton in his address to the people of Derry, November 30, 1995. Seamus Heaney’s version of the play by Sophocles, written in the 5th century B.C., sets before us the predicament of the outcast hero, Philoctetes, whom the Greeks marooned on the island of Lemnos and forgot about until the closing stages of the Siege of Troy. Abandoned because of a foul wound to a foot, Philoctetes nevertheless possesses an invincible bow without which the Greeks cannot win the Trojan War. They are forced to return to Lemnos and sue for Philoctetes’ support. The play probes the conflict between personal integrity and political expediency. It explores the relationship between public and private morality. It examines the consequences of outrage and obligation.